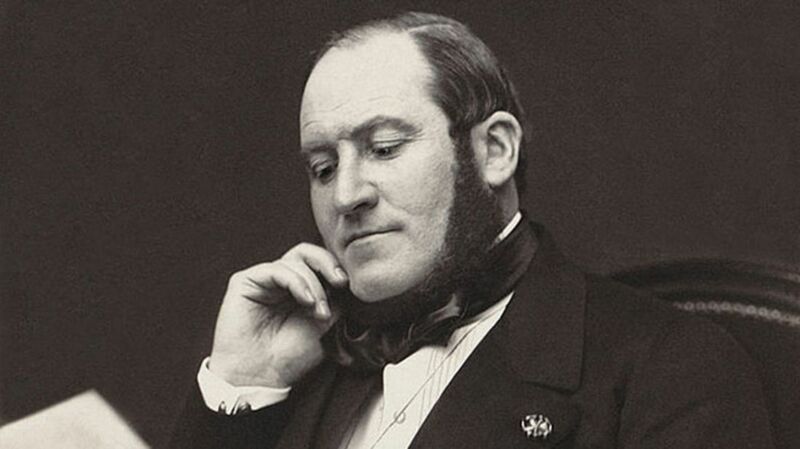 Georges-Eugène Haussmann (1809–91) was better known as Baron Haussmann (pictured above), the man who helped rebuild modern Paris into the city it is today. And yet his lofty title was nothing of the sort—it was in fact a nickname and not an official title at all. Haussmann was clearly a man of great vision and talent: under the direction of Napoleon III, he redesigned 19th-century Paris from a cramped, sewage-strewn city to the beautiful capital it is today, with boulevards, public spaces, and handsome facades. Haussmann’s vast achievement is especially impressive considering he had no training as an architect or urban planner—just like he had no title. Joshua Norton had a fairly lowly beginning, being born into a family of merchants in London around 1819. He moved to California in 1849 as the gold rush hit and made his fortune as a businessman, but after a deal went bad, he lost it all and resorted to vagrancy. In 1859 he posted a decree in the San Francisco Bulletin proclaiming himself Norton I, Emperor of the United States. He began wearing a military uniform and issuing frequent decrees on a variety of subjects. San Franciscans immediately took him into their hearts, and for the next 20 years he became something of a local celebrity—offered free meals and transport, and lauded wherever he went. When Norton died in 1880 some 10,000 people turned out to say a fond farewell to their emperor. Tsar Peter III was loved by the serfs (Russian peasants) for proposing legislation that might lead to their emancipation, but was forced to abdicate just six months into his reign, and murdered eight days after abdication. His wife and successor Catherine the Great was not keen on setting the serfs free, and instead introduced greater powers for the nobility over their serfs. Yemelyan Pugachev was a serf with a grudge. He proclaimed himself the long-lost Tsar Peter III and launched a peasant’s revolt (1773–75) against Catherine, promising to end serfdom for good. Many flocked to his cause and thousands were killed in the struggle, but ultimately it was futile and Pugachev was captured and executed. The serfs did not gain emancipation until 1861. Kourtney Kardashian’s baby daddy Scott Disick likes to be known as “Lord Disick” after he bought an old UK title, Lord of the Manor of Cruckton Ford, over the Internet. Contrary to Disick’s belief, the title he bought does not make him royalty or even nobility; it is in fact an old vestige of the English feudal system and goes back to when lords of the manor were allotted an estate of land by the king, queen, or another powerful noble to whom they owed allegiance. The lord of the manor then rented out his manorial lands to local peasants and held certain local privileges such as hunting rights. Today most lord of the manor titles do not come with any actual physical property or estate and are thus fairly meaningless, indeed “Lord” Disick’s name should actually be styled Mr. Scott Disick, Lord of the Manor of Cruckton Ford, and not “Lord Disick” at all. Back in the 15th century a powerful Sultan of Sulu reigned over large swathes of the southern Philippines and Borneo, but since then the territory has been split into many parts and no longer forms one sultanate. This fact has not stopped various descendants of the original sultan of Sulu from claiming the title and the lands. Most recently, Esmail Kiram II proclaimed himself Sultan of Sulu, and in 2013 launched an audacious attack on the Malaysian state of Sabah on the island of Borneo in an effort to reclaim the lands. The disastrous invasion cost 60 people their lives, caused a diplomatic crisis between Malaysia and the Philippines, and got the self-proclaimed sultan no closer to his goal of reclaiming his birthright. An antipope is someone who claims to be pope when an officially sanctioned Roman Catholic pope is already holding the position. This has occurred at least 40 times in history, often because rival factions have used the papacy as a political pawn. Benedict XIII was antipope for nearly 30 years (1394–1422) during the Western Schism, when the Roman Catholic Church split into two halves. During his reign as antipope, Benedict was repeatedly asked to surrender his claim in order to bring unity back to the church, but Benedict refused and in an extremely convoluted saga he ultimately served as antipope to three Roman popes and two other antipopes. After Benedict’s death, another antipope was chosen to succeed him, but the two churches were soon reconciled and Pope Martin V was at last the only pope claiming the title. Louis Philippe ascended to the restored French throne in 1830, becoming the last king of France, but his legitimacy was immediately challenged when a mysterious woman appeared who contested his paternity. Maria Stella was an Italian eccentric who in 1821 received a letter from her father Lorenzo Chiappini, which he had asked be delivered after his death. In it, he claimed that when his wife had given birth to a son some mysterious nobles had arrived and asked him to swap his son for their daughter so that they might have a son and heir. Based on somewhat flimsy evidence, Maria Stella decided that the unnamed nobles must have been the Duc and Duchesse of Chartres, the parents of Louis Philippe. She took her claim to an ecclesiastical court, who ruled that the letter from her father was indeed true but that the Duc of Chartres was not the noble in question. Maria Stella persisted with her claims, and buoyed by the fact that many thought Louis Philippe did indeed resemble an Italian peasant, she published a number of pamphlets claiming that Louis Philippe was an imposter. Maria Stella’s true father was never categorically established and Louis Philippe succumbed to another revolution, ending his days as king in exile in England.